The teenager worked on the project methodically, writing down each of his thoughts and feelings on small pieces of paper. The task was then to glue those expressions to large cut-out shields – the shields representing the barriers people put up when they are grieving. It was here that Harrison struggled. Every time he’d manage to jot down a thought or emotion, he’d crumble the paper up into a tight ball. One, two, three, four, five. The wads of paper sat like small fists of rage and hurt and pain. Still, the high school senior pressed on. Eventually, every tattered assertion of grief made it onto the shield. To the adults in the room, this was progress. Harrison was one of several students participating in an after school support group that was helping them work through the death of a classmate. Harrison had been close to the teen who died, and in the weeks since, his teachers had watched him withdraw and start to act out. He even quit his favorite sport, fearing he might lose control and hurt someone. But in this support group, Harrison was finding ways to unpack all those overwhelming emotions. Putting words to what he was feeling was in itself a victory. That he glued those tight, twisted pieces of paper to his shield – despite the pain he so visibly experienced in doing so – well, that was Harrison validating his feelings. Big steps in the murky world of grieving. It’s the type of healing that Annie’s Hope – The Center for Grieving Kids strives for with every child it serves. 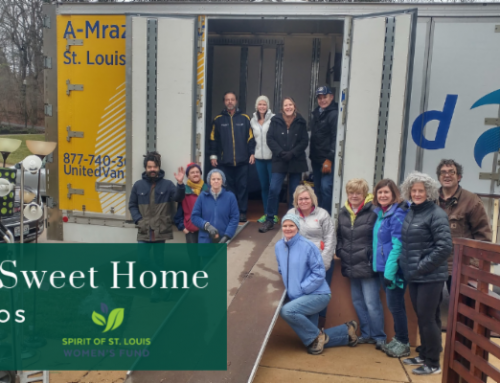 Since Executive Director Becky Byrne founded Annie’s Hope out of her home in 1998, the impact and reach of the organization has grown exponentially – from serving about 75 individuals in those early days, to approximately 3,600 annually. 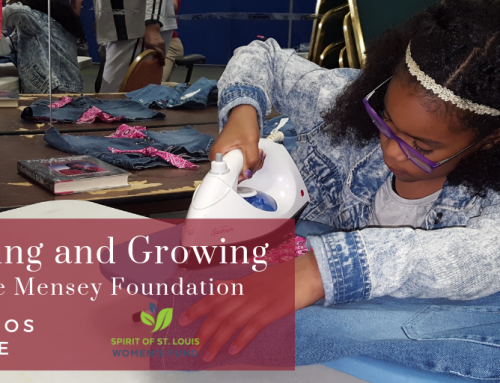 to celebrate two decades of growth, it is grateful for financial partners like the Spirit of St. Louis Women’s Fund. This is the second consecutive year that SOS has awarded a grant to Annie’s Hope for its school-based services. 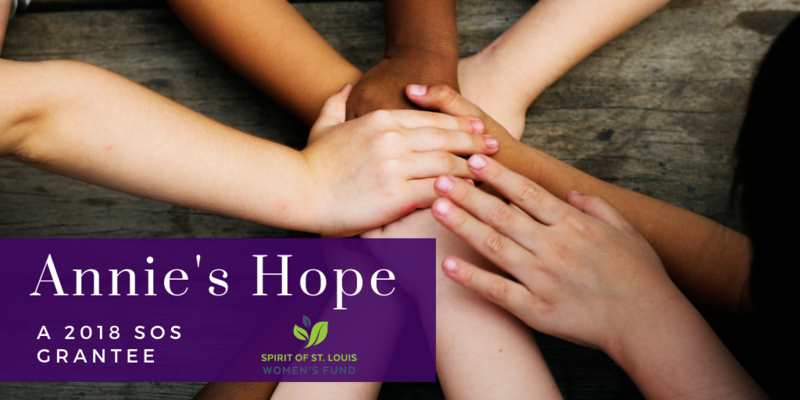 “Annie’s Hope could not serve as many broken-hearted, struggling, at-risk kids as we do each year without the generous funding of SOS,” LaBelle wrote in this year’s grant application. Annie’s Hope runs entirely off private donations, about a third of which come from grants. But even with generous funding, it is difficult to keep pace with the area’s demand for these services. The wait list for school-based services alone was at three to six months earlier this year. An office staff of 11 coordinates over 300 volunteers, running 10 different programs, several of which have their own waiting lists. This includes two summer camps, family support groups and retreats, a speakers institute and the Horizons program, which helps those who are anticipating the death of a loved one. 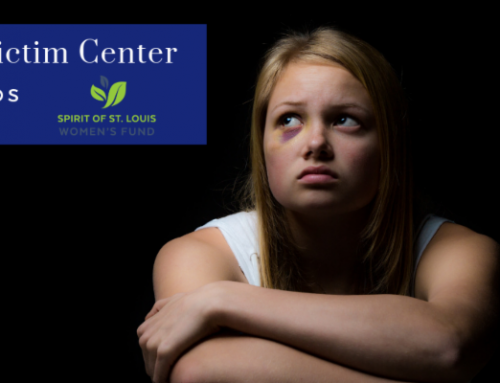 As many as 1 in 6 – or 50,074 – St. Louis area kids will experience the death of someone significant before they turn 18. That works out to about 3,975 newly bereaved youth in the community every year. Those numbers are specific to children who experience the death of a family member. It doesn’t include teens like Harrison, who have lost classmates or close friends. 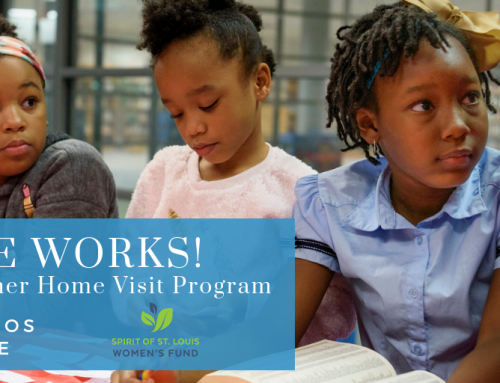 Nearly 70 percent of the kids that Annie’s Hope serves through its school-based services live in high-risk, low-poverty areas where violence and death are daily realities. Still, the organization recognizes that grief is universal. Thus, so is its outreach and approach to providing services. Byrne’s organization is facing grief head on. And it is doing so in a way that allows kids to still be kids. The offices for Annie’s Hope are in the lower level of an old Glendale church, which is home base for many of the organization’s programs and activities. Individual rooms are set up according to age level, each providing a warm and welcoming atmosphere for kids who are suddenly having to deal with very adult-level feelings and experiences. But they are, at the end of the day, still kids. And reminders of that are everywhere. One room, for instance, is set up like a campsite, with bean bag pillows in a circle on the floor and a wooded, lake scene painted on the wall. Everything is geared toward helping the kids relax, so each child can work through grief in their individual way. Rather than follow a strict clinical model, Annie’s Hope offers an array of coping techniques through art and music therapy, casual conversation and games. Maybe it’s a round of Jenga, where removing each block offers the chance to identify a thought or feeling. Maybe it’s discussing day-to-day lives, and what’s changed now that their sister or brother or mom or dad is gone. Maybe it is a craft, like the shield that Harrison worked on, where visual expressions of grief prove easier than words themselves. Almost without fail, the kids find ways to work through the difficult stuff on their own. “We believe, in the core of our being, that when you get people together who share something in common, that’s where they can get their genuine, authentic support from each other,” Byrne said. A lot of what Annie’s Hope does is intuitive – recognizing, for instance, that all grief is specific to the individual, while also respecting it as the common denominator. 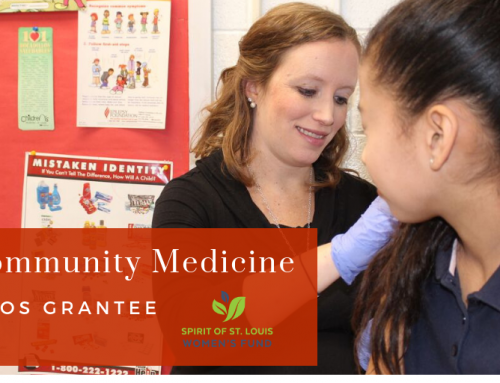 In a fractured St. Louis region where day-to-day realities can vary dramatically depending upon where you live, this philosophy proves particularly important. The child who watches their strong and authoritative father succumb to a disease that saps not only his spirit but also the meat from his bones and his ability to go to the bathroom on his own? That’s traumatic. Also traumatic? Watching your cousin get shot on the street. “We’re not one to say these situations are trauma-laden and these are not,” Byrne said. Instead, Annie’s Hope provides an atmosphere where the child can express themselves and be heard in a non-judgmental way. Staff and volunteers also help adults in the child’s life use the same tools for reaching through even the toughest walls of anger and denial. The tangible proof is hard to quantify. But it’s there, in improved grades, fewer visits to the principal’s office and conversations that would have never otherwise happened. All they did, Byrne said, was listen. 618 Creative . Photos provided by Annie’s Hope.